Kershaw - Handle length : 2. 6 " 6. 6 cm - blade length : 1. 4 " 3. 6 cm - weight : 1. 5 oz. Handle : copper and stainless steel stonewashed finish. Blade : stainless steel 3Cr13, stonewashed finish. 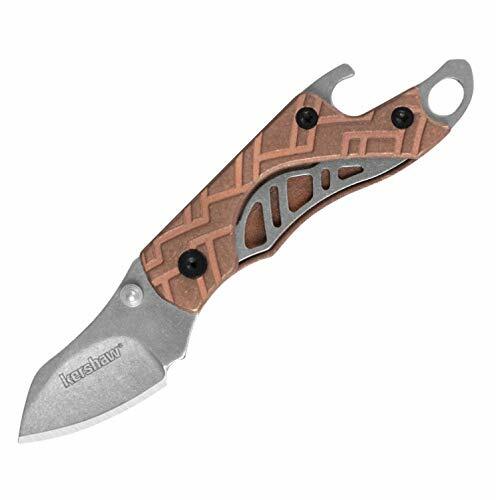 43 g. Kershaw cinder copper folding knife, copper, 1025CUX Brand : kershaw - model : Cinder Copper 1025CU. Specification : lanyard hole, bottle opener - Designed by knifemaker Rick Hindere. Space Pens 400-RAW - The fisher raw brass bullet Space Pen writes at any angle upside down underwater and in harsh temperature conditions hot and cold. Open the Bullet measures 5. 3 inches with a closed length of 3. 7 inches. Writes at any angle, even in Zero Gravity. Each fisher space pen is precision assembled and hand tested in the USA. When closed this pen slightly resembles a long bullet and it is this design that has been exhibited for a number of years by New York's Museum of Modern Art as an outstanding example of contemporary industrial design. Simply the most versatile pen ever made. Writes in extreme temperatures from -30F to 250F. Fisher Space Pen Raw Brass Bullet Pen 400-RAW - Each carries an unconditional lifetime guarantee. This pen casing is raw unfinished brass. Each fisher bullet space pen comes in an attractive gift box with a small pamphlet that provides the interesting history of the Fisher Space Pen. All the fisher bullet space Pen Series contains a PR4 Black Ink Medium Point Refill. Over time each pen will develop a unique patina as it responds to the environment, owner's body chemistry, and the way he or she handles their pen. Open the bullet measures 5. 3 inches with a closed length of 3. 7 inches and a diameter. Benchmade - Featuring a drop-point blade of american made CPM-S30V steel, the Bugout 535 folding knife provides exceptional edge retention and corrosion resistance. A do-everything tool, the bugout 535 is rounded out with our patented AXIS locking mechanism, lanyard hole, stainless steel liners, and reversible clip. Lifesharp/warrantyproudly designed and made in the USA, every Benchmade Knife comes with a limited Lifetime Warranty and LifeSharp Service. Our lifesharp service is provided to you free of charge. High-quality: the cpm-s30v stainless steel blade holds an edge exceptionally well and provides great corrosion resistance. The bugout 535 is a manual knife that can be opened and closed with just one hand. Lightweight: the 535 weighs less than 2 ounces, making it ideal for backpackers and others concerned with saving weight. Available for knives purchased from an authorized dealer. Each fisher space pen is precision assembled and hand tested in the USA. Benchmade - Bugout 535 - If your knife needs repair or sharpening, Benchmade will take care of it. The reversible, deep-carry pocket clip offers ultimate accessibility. Versatile: the 535 bugout's drop-point, utility blade style and all-around functionality make it ideal for outdoor adventures and everyday use. Guaranteed for life: benchmade's limited lifetime warranty and LifeSharp Service keeps your knife in the best condition. Spyderco SS-BRK-SC122GPGR - 4 3/8" closed liner lock. Crafted from the highest quality materials. Made in China. Built for performance and durability. Reversible stainless pocket clip. Lanyard hole. 3 3/8" 8cr13mov stainless standard edge blade with thumb hole and thumb ridge. Green g-10 handles. Spyderco C122GBBKP - Tested for quality and durability. Blade length: 3. 39". A black 4-way pocket clip lets the folder be set in a variety of carry and draw positions: Tip-up/tip-down left-hand/right-hand. Sharp from tip to hilt, the Tenacious offers the most cutting edge possible for the blade's length. Handle material: G-10 Blade steel: 8Cr13MoV. The blade's shape, coupled with an oversized Spyderco Round Hole, position the hand for instant and confident blade opening. The mid-sized tenacious has a black G-10 laminate handle, ergonomically milled with prolonged fatigue-free cutting in mind. Made using the highest quality materials. The most trusted name in you cutlery needs. Spyderco Tenacious Plain Edge Folding Knife, Black/Black - Length closed: 4. 45". Skeletonized steel liners tucked inside the handle, increase the handle's rigidity and strength without non-functional weight or thickness. The 8cr13mov stainless blade is coated in a non-reflective black coating and ground-flat from spine to cutting-edge for non-stop cutting. Length overall: 7. Spyderco SS-BRK-SC122GPBBN - The most trusted name in you cutlery needs. 3 3/8" black finish 8cr13moV stainless standard edge leaf shaped blade with thumb hole and thumb ridge. Length closed: 4. 45". 4 3/8" closed linerlock. Tested for quality and durability. Handle material: G-10 Brown g-10 handles. Lanyard hole. Made using the highest quality materials. Crafted from the highest quality materials. The word tenacious means one holds fast; one is persistent and cohesive; being tough and tireless until achieving your goal. Built for performance and durability. Length overall: 7. 76". Blade length: 3. 39". Four-way reversible black finish stainless pocket clip. Blade steel: 8Cr13MoV. Spyderco Tenacious Linerlock Brown - Made in China. Spyderco 8612 - Built for performance and durability. Made in China. Blade steel: 8Cr13MoV. The blade is made of steel. Made using the highest quality materials. The spyderco tenacious black G-10 knife has a PlainEdge. Length closed: 4. 45". Blade length 3 3/8" 86mm. Handle material: G-10 Blade length: 3. 39". It has a black g-10 laminate handle, milled with prolonged fatigue-free cutting in mind. The most trusted name in you cutlery needs. Blade steel 8CR13MOV. Length overall: 7. 76". Weight 4oz 115g. Handle material G-10 It is tough and tireless until the goal is achieved. Tested for quality and durability. The handle material is G-10 Crafted from the highest quality materials. Spyderco C11FPBL - 4-way clip. Made in China. The most trusted name in you cutlery needs. Weight 4oz 115g. Blade length 3 3/8" 86mm. Built for performance and durability. 4 1/4" closed lock back. Tested for quality and durability. Black finish stainless pocket clip. Full flat-ground blade. Made using the highest quality materials. Enlarged opening hole. Spine jimping. Built for performance and durability. Made in Japan. Phosphor bronze washers. Frn bi-directional Textured handle. David boye Dent. Handle material G-10 Length closed: 4. 45". Vibrant fiberglass reinforced nylon handles with Bi-Directional Texturing for slip-free tactile traction. Crafted from the highest quality materials. Spyderco Delica4 Lightweight FRN Flat Ground PlainEdge Knife Blue - Crafted from the highest quality materials. Screw-together construction. Skeletonized steel internal liners. Spyderco C142GP - Reversible stainless pocket clip. Dimensions: 9. 375 inches open; 5. 25 inches closed; 4. 25-inch blade; limited lifetime warranty. Handle material G-105 1/4" closed liner lock. 4 1/4" full-flat ground 8Cr13MoV stainless standard edge blade with thumb hole pull. Tested for quality and durability. Crafted from the highest quality materials. Blade steel: 8Cr13MoV. Made using the highest quality materials. Enlarged opening hole. Spine jimping. Built for performance and durability. Screw-together construction. Skeletonized steel internal liners. Full flat-ground blade. Crafted from the highest quality materials. Plain edge folding knife with flat ground steel blade, G10 handle, and 4-way hourglass clip. Spyderco C142GP Resilience Folding Knife G-10 Handle - Handle material: G-10 Length closed: 4. 45". Phosphor bronze washers. Benchmade B07CSBPN9F - Crafted from the highest quality materials. Length closed: 4. 45". Blade length 3 3/8" 86mm. Whether you need your knife repaired or sharpened, Benchmade will take care of it for free. Dimensions: 9. 375 inches open; 5. 25 inches closed; 4. 25-inch blade; limited lifetime warranty. Plain edge folding knife with flat ground steel blade, G10 handle, and 4-way hourglass clip. Length overall: 7. 76". Built for performance and durability. Enlarged opening hole. Spine jimping. Phosphor bronze washers for fast, smooth open/close action. The reversible, mini deep-carry pocket clip offers ultimate accessibility. Versatile: the bugout 535-1's drop-point, utility blade style and all-around functionality make it ideal for outdoor adventures and everyday use. Bugout 535 Folding Knife for Everyday Carry and Camping, Drop-Point Blade, Plain Edge, Coated Finish, Green Handle - Benchmade - Guaranteed for life: benchmade's limited lifetime warranty and LifeSharp Service ensure that your knife is in the best condition for its entire life. Full flat-ground blade. Crafted from the highest quality materials. Subtle, yet capable, the latest version of the Bugout was developed to be easily carried anywhere without drawing attention to itself. Spyderco SC101PBL2-BRK - Screw-together construction with skeletonized steel liners. Stainless wire pocket clip. Plain edge folding knife with flat ground steel blade, G10 handle, and 4-way hourglass clip. 3 3/8" full-flat ground ctS-BD1 stainless blade with thumb hole pull and thumb ridge. Crafted from the highest quality materials. Bd-1 carpenter steel blade with rust-resistant high-carbon and chromium content. Fiberglass-reinforced co-polymer handle with jimped areas on perimeter. Dimensions: 9. 375 inches open; 5. 25 inches closed; 4. 25-inch blade; limited lifetime warranty. Blade length 3 3/8" 86mm. 4 5/8" closed. Phosphor bronze washers for fast, smooth open/close action. Spyderco Manix2 FRCP PlainEdge Folding Knife C101PBL2 - Weight 4oz 115g. Built for performance and durability. Features Bi-Directional Texturing. Made in China. Built for performance and durability. Crafted from the highest quality materials. Spyderco SS-BRK-SC122GPBN - Made in United States. Made in Japan. Folding plain-edged knife with semi-opaque dusk blue handle. 3 3/8" satin finish 8cr13moV stainless standard edge leaf shaped blade with thumb hole and thumb ridge. Length overall: 7. 76". Measures 4. 67 inches closed and 8 inches overall; weighs 2. 85 ounces. Tested for quality and durability. The reversible, mini deep-carry pocket clip offers ultimate accessibility. Versatile: the bugout 535-1's drop-point, utility blade style and all-around functionality make it ideal for outdoor adventures and everyday use. Guaranteed for life: benchmade's limited lifetime warranty and LifeSharp Service ensure that your knife is in the best condition for its entire life. Spyderco Tenacious Linerlock Brown - Crafted from the highest quality materials. The glass-filled grivory handle is comfortable, thin, and attractive, tough, making it ideal for outdoor use and everyday carry. Well-designed: benchmade's axis lock is exceptionally strong and fully ambidextrous. Plain edge folding knife with flat ground steel blade, G10 handle, and 4-way hourglass clip. High-quality: the cpm-s30v coated stainless steel blade holds an edge exceptionally well and provides great corrosion resistance. Dimensions: 9. Spyderco C10FPBL - 4-way clip. Screw-together construction with skeletonized steel liners. Blade length: 3. 39". Handle material: G-10 The glass-filled grivory handle is comfortable, tough, and attractive, thin, making it ideal for outdoor use and everyday carry. Well-designed: benchmade's axis lock is exceptionally strong and fully ambidextrous. Made in Japan. Handle material G-104-way clip. Weight 4oz 115g. Length overall: 7. 76". Black stainless pocket clip. Tested for quality and durability. Measures 4. 67 inches closed and 8 inches overall; weighs 2. 85 ounces. Made in Japan. Made in United States. Built for performance and durability. Blade steel: 8Cr13MoV. Phosphor bronze washers for fast, smooth open/close action. Spyderco Endura4 Lightweight FRN Flat Ground PlainEdge Knife Blue - Vibrant fiberglass reinforced nylon handles with Bi-Directional Texturing for a slip-free tactile traction. Spyderco C136GP - Enlarged opening hole. Spine jimping. 6. 8-inch overall length, 2. 75-inch blade length, 3. 3-ounce weight, 4. 1-inch closed length, 05-inch hole diameter, and three-millimeter blade thickness. Includes limited manufacturer's warranty; details included with purchase. Full flat-ground blade. Crafted from the highest quality materials. Crafted from the highest quality materials. Plain edge folding knife with flat ground steel blade, G10 handle, and 4-way hourglass clip. Skeletonized steel liners tucked inside handle, increasing rigidity and strength without adding weight; 8Cr13MoV stainless steel blade, ground flat. High-quality: the cpm-s30v coated stainless steel blade holds an edge exceptionally well and provides great corrosion resistance. Spyderco C136GP Persistence Folding Blade Knife - Folding plain-edged knife with semi-opaque dusk blue handle. Tested for quality and durability. 4-way clip. Crafted from the highest quality materials. Oversized round hole positioned relative to blade's pivot point to optimize one-handed opening and closing; four-way pocket clip lets knife sit tip-up or tip-down, left- or right-handed. Built for performance and durability. Built for performance and durability. Valtev - The coolest small folding Pocket Knife You Will Ever Own. Comes with a sturdy 1680d density belt mountable nylon pouch with press snap clasp, not the 300D nylon usually used. This product has a hassle free 30 day money back guarantee Click the button on the top of this page to make your purchase with confidence Quality item designed to fit comfortably into your hand, just like the one Grandpa had. Light enough to carry in your pocket or handbag just 1. 5 oz, or keep handy on a keychain. Ideal pocket knife for women, made for serious cutting, open 5 1/2", 2 1/4 inch long blade is made from 3Cr13 Stainless Steel, closed 3 1/8". Lovely grain in this genuine wood handle, the sharp blade locks when open for user safety. Valtev Small Pocket Knife, Polished Wood Inlay Handle, Quality Stainless Steel Lockback Blade, Sturdy Nylon Pouch or Keep On a Keychain - Pocket knifes specifications:-- blade length: 2 1/4 inches - blade material: 3cr13 stainless steel - locking: yes - Polished wooden handle - Sheath: Yes, Heavy Duty 1680D Density Nylon with firm press snap fastener - Open Length: 5 1/2 inches - Closed Length: 3 1/8 inches - Weight: 1. 5 ounce - nail notch in the blade for easy opening - The locking feature ensures safety during any activity, if you have ever had a blade close on your hand during use you will appreciate this safety feature. The strong and durable nylon pouch can be belt mounted providing a safe and secure place to keep this craft knife - Add it to your camping gear or for outdoor activities like survival gear, fishing, hunting, walking, sailing, gardening or personal use. Uses are endless, whittling, letter opener, carving, quality, cutting, a great pencil sharpener or just a fun, slicing, stylish personal tool to have which feels really nice to hold and handle. Ideal boys gift, mens gift, womens gift or for boy scouts - Need a handy tool to keep handy around the house or in the glove box of the car. Gerber 22-41324 - Blade length: 2. 5 inches; closed Length: 3. 4 inches & overall Length: 6 inches. Weight: 2. 2 oz. Imported. A lanyard hole provides an alternative to pocket carrying. Winchester, pocket knife, brass, 2.5" long, surgical stainless steel blade, can be used in various military, industrial & outdoor situations, Survival, brass folder, wood handle inlays, brass bolsters, tactical, hunting, all products are field tested, blade length 2. 47", blister Pack. Locking mechanism: traditional lockback. The stainless blade is emblazoned with Winchester and has a nail nick for easy opening. It is constructed of stainless steel with attractive wood overlays and polished brass bolsters. Valtev - Light enough to carry in your pocket or handbag weighing in at just 2. 2 oz. A very cool small Pocket Knife. Locking mechanism: traditional lockback. This product has a hassle free 30 day money back guarantee Click the button on the top of this page to make your purchase with confidence It is constructed of stainless steel with attractive wood overlays and polished brass bolsters. The stainless blade is emblazoned with Winchester and has a nail nick for easy opening. Weight: 2. 2 oz. Imported. Uses are endless, a great pencil sharpener or just a fun, carving, cutting, slicing, quality, letter opener, whittling, stylish personal tool to have which feels really nice to hold and handle. Quality small pocket knife designed to fit comfortably into your hand, just like the one Grandpa had. 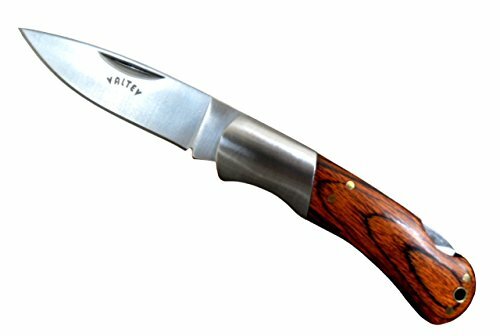 Valtev Small Pocket Knife No2, Polished Wood Inlay Handle, Quality Stainless Steel Lockback Blade, Sturdy Nylon Pouch - Comes with a sturdy 1680d density belt mountable nylon pouch with press snap clasp, not the 300D nylon usually used. Blade length: 2. 5 inches; closed Length: 3. 4 inches & overall Length: 6 inches. The strong and durable nylon pouch can be belt mounted providing a safe and secure place to keep this craft knife - Add it to your camping gear or for outdoor activities like survival gear, sailing, fishing, hunting, walking, gardening or personal use. Pocket knifes specifications:-- blade length: 2 1/2 inches - blade material: 3cr13 stainless steel - locking: yes - Polished wooden handle - Sheath: Yes, Heavy Duty 1680D Density Nylon with firm press snap fastener - Open Length: 5 3/4 inches - Closed Length: 3 3/8 inches - Weight: 2. GRAND WAY - One of really good knives for men. Blade made of stainless steel 440c - classic knife steel, which is used for the production of knives for over 50 years. Weight: 2. 2 oz. Imported. Our goal is to bring together all the best, devised and tested over the years in the knife industry. Surface of the blade: satin finish handle material: wood, tactical, 5" hardness of the steel: 57-58 hrc blade width: 28 ММ 1, hunting, 76" overall length: 210 ММ 8, souvenir, 102" handle length: 121 ММ 4, 26" weight: 150 g 5, metal lock type: liner lock steel mark: 440c blade thickness: 2, 11" blade length: 89 ММ 3, 29oz The company «GRAND WAY» - is engaged in production and development of projects of knives folding, 8 MM 0, etc. With more than 1000 species. Under its own brand for over 15 years. Ideal pocket knife for women, made for serious cutting, 2 1/2 inch long blade is made from 3Cr13 Stainless Steel, open 5 3/4", closed 3 3/8". Lovely grain in this genuine wood handle, the sharp blade locks when open for user safety. Grandway 6651ow - cool pocket folding knife is designed for use by hunters, fishermen and tourists. Pocket Knife with Wood Handle - EDC Pocket Folding Knife with safety liner lock for Camping Hunting Survival and Outdoor 6651 - Grand Way Gentleman’s Folding Knife - It is every day carry gentleman's knife. Blades of this type have a maximum balance between properties of durability and penetration. The "plus" of the material is an excellent corrosion resistance and the ability to "hold" the cutting edge for a long time. Cheesision - 440 stainless steel blade, drop point edge. Ideal pocket knife for women, 2 1/2 inch long blade is made from 3Cr13 Stainless Steel, open 5 3/4", made for serious cutting, closed 3 3/8". Lovely grain in this genuine wood handle, the sharp blade locks when open for user safety. Comes with a sturdy 1680d density belt mountable nylon pouch with press snap clasp, not the 300D nylon usually used. 100% guaranteed - if you are not completely satisfied, please contact us to rectify the issue. Blades of these types have a maximum balance between sharps and strength properties. One of really good knives for men. Blade made of stainless steel 440c - classic knife steel, which is used for the production of knives for over 50 years. Cheesision Small Pocket Knife Resin Handle Outdoor Hunting Camping Mini Folding Knives Stainless Steel Blade, Small Outdoor Pocket Knife Survival Tool - Blade length: 2. 5 inches; closed Length: 3. 4 inches & overall Length: 6 inches. Cheesision designed folding pocket knife to be seamlessly used for everything from Camping to Search & Rescue and is a great Business or Birthday Gift. It is constructed of stainless steel with attractive wood overlays and polished brass bolsters. Locking mechanism: traditional lockback. Lock free design - the spring is automatically fixed for safety and convenience. A.C. Kerman - Direct FP20742 - Ideal pocket knife for women, open 5 3/4", 2 1/2 inch long blade is made from 3Cr13 Stainless Steel, made for serious cutting, closed 3 3/8". Lovely grain in this genuine wood handle, the sharp blade locks when open for user safety. Many of our products are proprietary designs often copied and others inspired by classic survival/defensive tools and edged weapons. Never be left stranded without the pocket knife again. Rosepakka hardwood Handle with Stainless Pins. A lanyard hole provides an alternative to pocket carrying. Locking mechanism: traditional lockback. Lock free design - the spring is automatically fixed for safety and convenience. Blade length: 2. 5 inches; closed Length: 3. Fury Nobility Raindrop Razor Edge Blade Folding Knife with Rose Pakka Handle, 2-Inch - 4 inches & overall Length: 6 inches. One of really good knives for men. Blade made of stainless steel 440c - classic knife steel, which is used for the production of knives for over 50 years. It is constructed of stainless steel with attractive wood overlays and polished brass bolsters. Delicate handle - resin handle feel comfortable, delicate and beautiful, anti earthquake and wear-resistant. Fox Chapel Publishing - The stainless blade is emblazoned with Winchester and has a nail nick for easy opening. A lanyard hole provides an alternative to pocket carrying. Light enough to carry in your pocket or handbag weighing in at just 2. 2 oz. One of the great pocket knives. Mini size - small pocket knife full length: 4. 75 inch, handle length: 2. 75 inch, weight: 1. 6 ounce, mini size fits perfectly in your palm. Blade material - 440 stainless steel, shaving sharp and good toughness. No need to worry that hardness is not easy to break. Blades of these types have a maximum balance between sharps and strength properties. 440 stainless Steel Blades and Bolster. Complete Starter Guide to Whittling: 24 Easy Projects You Can Make in a Weekend Fox Chapel Publishing Beginner-Friendly Step-by-Step Instructions, Tips, and Ready-to-Carve Patterns for Toys & Gifts - Locking mechanism: traditional lockback. They present 24 easy whittling projects that you can make in just a weekend, how-to photographs, complete with step-by-step instructions, ready-to-carve patterns, and helpful tips. Start off with fast and fun projects that build confidence and teach fundamental carving techniques, like a simple flying propeller or a 5-minute owl. Comes with a sturdy 1680d density belt mountable nylon pouch with press snap clasp, not the 300D nylon usually used. All you need is a knife, a twig, and this book!We've assembled a team of 12 leading woodcarvers to bring you a complete starter's guide to whittling. Weight: 2. • Best Value Premium Basswood Carving/Whittling Large Beginners KIT. 25% More Wood Than Other Large Kits! Suitable for Kids or Adults, Beginner to Expert. Unfinished Kiln Dried Whittling Blocks. Walnut Hollow WH4005 - This package contains 2 pieces sized 1" x 2" x 3/4", 3 pieces sized 1 1/2" x 2" x 3/4", 2 pieces sized 1" x 4" x 3/4", and 3 pieces sized 1 1/2" x 4" x 3/4". Made in wisconsin, USA. It is constructed of stainless steel with attractive wood overlays and polished brass bolsters. Fox-38428. Brand new item / Unopened Product. Pocket knife with wood handle - gives this pocket knife a great look. Folding knife, excellent design - wooden handle, "liner lock" assembly locking - all signs of folding blade allows to use it as pocket knife. Never be left stranded without the pocket knife again. Rosepakka hardwood Handle with Stainless Pins. Walnut Hollow Basswood Whittlers Carving Blocks 10 Piece - 9781565238428. Delicate handle - resin handle feel comfortable, delicate and beautiful, anti earthquake and wear-resistant. Quality small pocket knife designed to fit comfortably into your hand, just like the one Grandpa had. Blades of these types have a maximum balance between sharps and strength properties. This product weighs 050-pounds. The "plus" of the material is an excellent corrosion resistance and the ability to "hold" the cutting edge for a long time. • NoCry Cut Resistant Gloves for Kids, XS (8-12 Years) - High Performance Level 5 Protection, Food Grade. Free Ebook Included! KUBEY - Thumb stud button can open smoothly on its ball bearing pivot system. Comes with a sturdy 1680d density belt mountable nylon pouch with press snap clasp, not the 300D nylon usually used. Classic rosewood handle with a beautiful appearance and an excellent workmanship, which is handmade polished to provide a comfortable and sturdy grip with good shock absorption. Weight: 2. 2 oz. Imported. Provides razor sharp cutting performance and high durability. Comfortable grip: rosewood handle inlaid steel sheet is finely polished to provide a comfortable and non-slip grip which is better than G10 handle when you need shock absorption function. Blade length: 2. 5 inches; closed Length: 3. KUBEY Pocket Knives with Wooden Handle Razor Sharp Blade Safety Liner Lock Folding Outdoor Camping Hunting Knife Tool, Small Size KU112 - 4 inches & overall Length: 6 inches. Locking mechanism: traditional lockback. 100% guaranteed - if you are not completely satisfied, please contact us to rectify the issue. Brand new item / Unopened Product. Lock free design - the spring is automatically fixed for safety and convenience. Delicate handle - resin handle feel comfortable, delicate and beautiful, anti earthquake and wear-resistant. Each piece is professionally kiln dried and sanded smooth. STARIMCARBON - Weight: 2. 2 oz. Imported. If you are not completely satisfied with your purchase, please contact us before leaving neutral or negative feedback/review. Razor Blade Edge. Application✔ as hunting knife; survival knife; spring assisted knife; tactical pocket knife; rescue knife; assisted opening knife; camping knife. One of the great pocket knives. Mini size - small pocket knife full length: 4. 75 inch, handle length: 2. 75 inch, weight: 1. 6 ounce, mini size fits perfectly in your palm. Blade material - 440 stainless steel, shaving sharp and good toughness. No need to worry that hardness is not easy to break. Enjoy your shopping and wish you all the best! It is constructed of stainless steel with attractive wood overlays and polished brass bolsters. STARIMCARBON 4.6" Mini Pocket Folding Tactical Tool Knife, Rosewood Handle, Left/Right Handed, Sparkling Gifts for Men/Collections - The "plus" of the material is an excellent corrosion resistance and the ability to "hold" the cutting edge for a long time. Liner lock - fixing of the blade in the open position is provided by a linear lock, which is extremely tough, resistant to dirt and allows you to open and close the knife enough easily. Drop point blade type of hunting fold knife - a classic drop-point. Brand new item / Unopened Product. Best choice: kubey professional outdoor knife is fully qualified, is suitable for camping hiking hunting and other outdoor creation activity. Case 02758 - Best choice: kubey professional outdoor knife is fully qualified, is suitable for camping hiking hunting and other outdoor creation activity. A lanyard hole provides an alternative to pocket carrying. Dimensions: total length: 5. 6 inch, blade length: 2. 4 inch, handle length: 3. 1 inch, blade height: 08 inch, blade thickness: 2. 0mm, knife net weight: 2. 9 oz. Shaving sharp: compact pocket knife d2 blade of drop point type, hardness 59-61HRC, after vacuum heat treatment, excellent balance of hardness and toughness. Tru-sharp surgical stainless steel blade. Comes conveniently packaged in a box. Soft wood with no knots makes carving smooth and easy. Case 2758 PktWorn Old Red Bone CrnCb Jig Lockback 61225L SS - Weight: 2. 2 oz. Imported. It is constructed of stainless steel with attractive wood overlays and polished brass bolsters. Design Originals. Pivot and screw are tightened and action is great. The case small red Bone Lockback is a must own Case Product. ENNSUN - Or you can contact us to get a new replacement. Specification】open length: 8. 94 inches; closed length: 5 inches; Blade length: 3. 94 inches; Blade width: 1. 4 inches; Net Weight: 8. 21oz; weight with package: 106oz. Free charged Leather Sheath included. Advantages 1】type: folding knife; blade material: 7Cr13Mov; Hardness: 58HRC; Handle material: Stainless Steel Carved Totem +ebony lock. Advantages 2】special design of chinese style carved totem. Precious collection Choice and a cool gift for man. Advantages 3】carry type: pocket clip; Essential Good for work, hunting, gift, camping, outdoor survival, hiking, Collection. Warranty】lifetime limited warranty for all ennsun products -100% REFUND PROMISE for any unqualified purchased. TAC Force - Karambit folding knife. Nice and well balanced knife. Victorinox VN06223L1805US2-BRK - Great Pyramids handle artwork. 2. Tools include: file l keyring l Scissors l Small blade l Small screwdriver l Toothpick l Tweezers. Abs handle. Crafted from the highest quality materials. May not ship International. 25" closed. Limited edition 2018. Made in Switzerland. Built for performance and durability. Pre-approval is required in order to sell Victorinox MAP products. Victorinox Swiss Army 041863 - Fits classic SD Style Only. The world's most know brand for multi-tools and pocket knives. Designed specifically to fit the Classic SD knives by Victorinox Swiss Army. Faux leather pOUCH ONLY. Keep your swiss army classic sd knife safe on your keys! This pouch offers sung protection to keep your Classic SD looking brand new. Keeps your SD from getting damaged. Easily remove to use when needed. Compact and sturdy. Victorinox - Genuine victorinox Swiss Army Knife made in Switzerland. The world's most know brand for multi-tools and pocket knives. Keeps your SD from getting damaged. It all started with the swiss officer's Knife - and more than a century later, the Swiss Army Knife is still an icon of sleek functionality. It's the easiest lifetime commitment you'll ever make. Each one is built to last a lifetime and in the Classic you'll find all the functionality you need for your everyday adventures - in a package you'll want to keep with you always. Small blade, scissors, nail File with Screwdriver Tip, toothpick, tweezers, Key Ring. Lifetime Warranty. 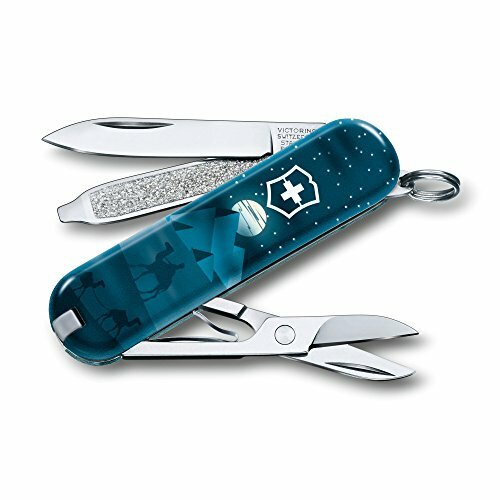 This unique classic sd, made in Switzerland by Victorinox Swiss Army, features a parade of puppies of many breeds and sizes. Puppy Parade Classic SD Swiss Army Knife by Victorinox - Fits classic SD Style Only. Exclusive Puppy Parade Print Pattern. Compact and sturdy. Faux leather pOUCH ONLY. Victorinox - Exclusive Puppy Parade Print Pattern. Compact and sturdy. The celtic classic sd limited edition swiss army knife by victorinox is a swiss knife shop exclusive showcasing a beautiful shamrock design - sure to please those who are Irish or even Irish at heart! Great knife to give to show your love! Beyond its unique design, original, the Celtic Classic SD is also an excellent and unique key holder. Swiss army celtic classic sd features: small Blade Scissors Nail File with Screwdriver Tip Toothpick Tweezers Key Ring Length Closed: 2. 25 inches fits classic SD Style Only. Genuine victorinox Swiss Army Knife made in Switzerland. Keeps your SD from getting damaged. This miniature tool is small enough to fit in any pocket, handbag - anywhere. Victorinox Swiss Army Celtic Classic SD Limited Edition - Faux leather pOUCH ONLY. Add this iconic, original, Swiss-made multi-tool by the makers of the Original Swiss Army Knife to your collection. Small blade, tweezers, toothpick, Scissors, Nail File with Screwdriver Tip, Key Ring. Lifetime Warranty. This miniature tool is small enough to fit in any pocket, glove compartment, handbag - anywhere. The world's most know brand for multi-tools and pocket knives. Add this iconic, glove compartment, Swiss-made multi-tool by the makers of the. Victorinox 0.6223.L1803 - Blade - 2. Swiss made pocket knife with 7 functions. The celtic classic sd limited edition swiss army knife by victorinox is a swiss knife shop exclusive showcasing a beautiful shamrock design - sure to please those who are Irish or even Irish at heart! Great knife to give to show your love! Beyond its unique design, original, the Celtic Classic SD is also an excellent and unique key holder. Nail file with : - 4. Tweezers - 6. The world's most know brand for multi-tools and pocket knives. Classic new york Fits classic SD Style Only. Screwdriver 2, 5 mm - 5. Keeps your SD from getting damaged. Faux leather pOUCH ONLY. This miniature tool is small enough to fit in any pocket, handbag - anywhere. Toothpick - 7. Victorinox 56225 - Nail file with : - 4. Stainless steel construction encased in polished Cellidor/ABS scales provides sleek durability. The world's most know brand for multi-tools and pocket knives. Toothpick - 7. Small blade, toothpick, nail File with Screwdriver Tip, Scissors, tweezers, Key Ring. Lifetime Warranty. Made in switzerland: Victorinox provides a lifetime guarentee against defects in material and workmanship. Genuine victorinox Swiss Army Knife made in Switzerland. Edition limited 2018 - model : new york - victorinox classic 06223. L1803 - length : 58 mm 2, 35 inches - weight : 21 g 0, 28 inches - Width : 9 mm 0, 74 oz. Tools : - 1. Swiss made pocket knife with 7 functions. All feature knife blade, nail file with screwdriver tip, toothpick, scissors, tweezers and keyring. Victorinox - Nail file with : - 4. Edition limited 2018 - model : new york - victorinox classic 06223. L1803 - length : 58 mm 2, 35 inches - weight : 21 g 0, 28 inches - Width : 9 mm 0, 74 oz. Tools : - 1. Knife contains 7 functions to equip you for any adventure Blade, Key Ring, Tweezers, Scissors, Nail File, Screwdriver, Toothpick. Length 2. 3" 58mm height 04" weight 08oz. Genuine victorinox Swiss Army Knife made in Switzerland. Tweezers - 6. Keeps your SD from getting damaged. Swiss made pocket knife with 7 functions. The classic sd galaxy is a Swiss Knife Shop exclusive featuring a beautiful shot of the galaxy. Key ring. Stainless steel construction encased in polished Cellidor/ABS scales provides sleek durability. Galaxy Classic SD Swiss Army Knife by Victorinox - Precision engineering makes this knife highly versatile yet compact to optimize functionality. Made in switzerland by victorinox Swiss Army, Makers of the Original Swiss Army Knife. Lifetime Warranty. Small blade, scissors, toothpick, Tweezers, Nail File with Screwdriver Tip, Key Ring. Victorinox 0.6223.941US2 - Swiss made pocket knife with 7 functions. Once dry, apply a drop of Swiss Army Knife Oil between each tool and its spring. Fits comfortably in your pocket or an easy-access addition to keys. Genuine victorinox Swiss Army Knife made in Switzerland. Karl supplied the swiss army with its standard issue Soldier’s Knife and Officer’s Knife. The world's most know brand for multi-tools and pocket knives. Faux leather pOUCH ONLY. If sharpening on a grinding wheel, always cool with plenty of water to avoid excessive temperatures and the resulting damages that may occur. Small blade, tweezers, toothpick, Nail File with Screwdriver Tip, Scissors, Key Ring. Victorinox Swiss Army Classic SD Pocket Knife, Desert Camo, 58mm - Lifetime Warranty. Length: 2. 25" 58mm, height:. 354", weight: 074 oz. Trusted quality. Compact and sturdy. Making a lifetime commitment has never been so easy. Everyday superhero compact enough to fit in your pocket or attach to your keys, the 2¼" Classic SD is the epitome of a Swiss Army Knife; foldable, versatile and always there when you need it. Victorinox Swiss Army Knives 54211 - Featuring 7 popular implements, stainless steel construction and Swiss-Made precision, the Classic SD is the perfect companion for everyone. Nail file with : - 4. Exclusive Puppy Parade Print Pattern. Features 7 functions: 1. 25" blade, scissors, nail file with screwdriver, key ring, tweezers, and toothpick - this versatile multi-tool is ready for any adventure. Durable construction. Cleaning if the blades of knife begin to stick together, open and close the blades in warm water several times - this will allow the tools to move easily again. The world's most know brand for multi-tools and pocket knives. Add this iconic, glove compartment, Swiss-made multi-tool by the makers of the. Victorinox Swiss Army Classic SD Pocket Knife, Translucent Ruby - Limited in the year 2018. Made in switzerland: Victorinox provides a lifetime guarentee against defects in material and workmanship. Today, and both the company and family still resides in the small village of Ibach, Victorinox is still owned and operated by the Elsener family, Switzerland. Equipped for everyday. Key ring. Fits comfortably in your pocket or an easy-access addition to keys. Fits comfortably in your pocket or an easy-access addition to keys. Victorinox 0.6223.L1804 - Keeps your SD from getting damaged. No need to leave this knife behind due to lack of space - it's the sidekick you can take anywhere. Knife dimensions. Length: 2. 25" 58mm, height:. 354", weight: 074 oz. Trusted quality. This miniature tool is small enough to fit in any pocket, handbag - anywhere. Scissors - 3. Made in switzerland; victorinox provides a lifetime guarantee against defects in material and workmanship. Swiss made pocket knife with 7 functions. Blade - 2. Nail file with : - 4. Toothpick - 7. The world's most know brand for multi-tools and pocket knives. Add this iconic, glove compartment, Swiss-made multi-tool by the makers of the. Limited in the year 2018. Made in switzerland: Victorinox provides a lifetime guarentee against defects in material and workmanship. Victorinox Classic Limited Edition 2018 Cappadocia - Swiss Army Knife 58 mm - Edition limited 2018 - model : cappadocia - victorinox classic 06223. L1804 - length : 58 mm 2, 35 inches - weight : 21 g 0, 28 inches - Width : 9 mm 0, 74 oz. Tools : - 1. Victorinox - This swiss army pocket knife is constructed with stainless steel and encased in polished ABS scales that provide ultimate durability in a translucent ruby finish. Compact carry. This miniature tool is small enough to fit in any pocket, handbag - anywhere. Making a lifetime commitment has never been so easy. Equipped for everyday. Swiss made pocket knife with 7 functions. No need to leave this knife behind due to lack of space - it's the sidekick you can take anywhere. Knife dimensions. Keeps your SD from getting damaged. Small blade, scissors, nail File with Screwdriver Tip, tweezers, toothpick, Key Ring. Lifetime Warranty. Victorinox Swiss Army Piano Classic SD Limited Edition - Key ring. Edition limited 2018 - model : cappadocia - victorinox classic 06223. L1804 - length : 58 mm 2, 28 inches - width : 9 mm 0, 35 inches - Weight : 21 g 0, 74 oz. Tools : - 1. Precision engineering makes this knife highly versatile yet compact to optimize functionality. Tweezers - 6. Dimension 9, LLC KM-P-Ray - Over 250 of the most popular male names in the United States are available. The rosewood multi-purpose tool from Dimension 9 is a useful Gift item worthy of any special occasion. Each knife is personalized through laser engraving with popular names, initials, and titles. Tools include scissors, file, corkscrew, saw blade, two screwdrivers, one knife blade, bottle opener, and a punch. Gloss coated rosewood finish with triple varnish. The multi-purpose tool also comes with a split ring for easy attachment to your key ring, belt loop, or bag. Ordering a blank multi-purpose tool without laser engraving is also a great option. Contains 10 useful stainless steel tools. Each knife features a gloss coated rosewood Finish which is triple varnished for extra protection against the elements. Dimension 9 Ray 9-Function Multi-Purpose Tool Knife, Rosewood - Don't see a name you're looking for choose from one of our initials or popular titles such as #1 dad or world's greatest fisherman. Measures 3. 50" x 075" x 6. 50" long when opened. It includes nine stainless steel tools including scissors, corkscrew, two screwdrivers, bottle opener, saw blade, and two knife blades. Caramel - Multi-tool contains cross screwdriver, pocket knife, the can opener scissors, fish scale scraping, bottle opener, the cork drill, pliers, sharp blade, small contusion sub, saw. It's the perfect everyday carry for quick fixes and small tasks that you inevitably run into during your daily adventures. Includes a sturdy, practical keychain loop so you can take your knife with you. Special gifts- stylish & tough yet lightweight, this multi-function tool is perfect for yourself or as a gift for your friends. Our product doesn't make you compromise between size, durability, or functionality so it's always the perfect go-to accessory. These are made of wood and stainless steel with a key chain carry. Personalized Multi-Purpose Pocket Tool Knife-Custom Engraving, Groomsmen Gift - Up to 3 lines Free Custom Engraving. Made of stainless Steel and Wood. These wooden swiss army style knives with key chain are ideal for DIY shops, hardware supply shops, outdoor gear manufacturers, sporting goods stores, and safety awareness campaigns. Experience hassle free travel with these Multi-function custom wooden Swiss army style knives with key chain. Lara International Inc - These wooden swiss army style knives with key chain are ideal for DIY shops, hardware supply shops, sporting goods stores, outdoor gear manufacturers, and safety awareness campaigns. Size:9cm*2. 9cm*3. 1cm. Slip joint allows for easy opening and folding of blade and tools. Experience hassle free travel with these 13-function custom wooden Swiss army style knives with key chain. Material: Wood. Made of stainless Steel and Wood. Up to 3 lines Free Custom Engraving. It comes with a highly strategic imprint area, your brand or company name will surely be showcased and will be clearly visible to your clients. People carrying these 13-function custom wooden Swiss army style knives with key chain are practically walking advertisements for your brand and thereby providing your business with a lot of exposure. Personalized Multitool Set 1 PIECE - Dimensions: 1"W x 3. 50"h. Engraving color may vary slightly, as each piece of wood is unique. Includes a sturdy, practical keychain loop so you can take your knife with you. Please don't forget to choose your font during customization!! These are made of wood and measures 1"W x 3. O.RIYA - If you have any problems with our items or services, please feel free to contact us first before you leave negative feedback. Slip joint allows for easy opening and folding of blade and tools. Love you grandpa gift - this is a great gift for the fisherman in your life a great granpa gift. Comes with o. Riya brand gift box, ready for giving.
. Engraving color may vary slightly, as each piece of wood is unique. Includes a sturdy, practical keychain loop so you can take your knife with you. Please don't forget to choose your font during customization!! Dimensions: 1"W x 3. 50"h. Size:9cm*2. 9cm*3. 1cm. Up to 3 lines Free Custom Engraving. Grandpa gifts for fathers day -this is also the best gift for father's Day! A perfect gift for Grandpa for any occasion, hand stamp with the words " LOVE YOU GRANDPA", Plated with silver color. O.RIYA Love You Grandpa Hand Stamped Lure Fisherman Gift - Grandpa Gifts From Grandchildren - Made of stainless Steel and Wood. I love my grandpa gift - Material: Stainless Steel, Silver Plated. Hand stamped fishing lure reads LOVE YOU GRANDPA. - One size fits us sizes 6 to 12- we've tested them! Crew style. 100% satisfaction guaranteed by sock my world - If you are not satisfied with your purchase for any reason, we will give you full refund. Love you grandpa gift - this is a great gift for the fisherman in your life a great granpa gift. Dimensions: 1"W x 3. 50"h. That easy! O. Riya jewelry ltd pays great attentions to the shopping experiences from the customers. Your satisfaction is the motivation for us to move forward. Slip joint allows for easy opening and folding of blade and tools. Up to 3 lines Free Custom Engraving. Non slip grip. The eye-catching words on the bottom of the socks are printed in non-slip grip. Do Not Disturb Grandpa Is Resting His Eyes Papa Socks NON SLIP Father's Day Birthday Dad Funny Gift Birthday Gift Mens - Includes a sturdy, practical keychain loop so you can take your knife with you. Special gifts- stylish & tough yet lightweight, this multi-function tool is perfect for yourself or as a gift for your friends. Size:9cm*2. 9cm*3. 1cm. Sports Accessory Store - Size:9cm*2. 9cm*3. 1cm. Be sure to check out our matching necklace! Made of stainless Steel and Wood. 100% satisfaction guaranteed by sock my world - If you are not satisfied with your purchase for any reason, we will give you full refund. Up to 3 lines Free Custom Engraving. The eye-catching words on the bottom of the socks are printed in non-slip grip. Talk about softness & quality - unlike ordinary socks, stretchy, sock my world socks are made of premium combed cotton which makes them extremely soft, and durable. Engraving color may vary slightly, as each piece of wood is unique. Includes a sturdy, practical keychain loop so you can take your knife with you. Abuela Crystal Heart Silver Lobster Claw Bracelet Jewelry Grandmother Gift - Please don't forget to choose your font during customization!! . Includes a sturdy, practical keychain loop so you can take your knife with you. Special gifts- stylish & tough yet lightweight, this multi-function tool is perfect for yourself or as a gift for your friends. Hand stamped fishing lure reads LOVE YOU GRANDPA. Love you grandpa gift - this is a great gift for the fisherman in your life a great granpa gift. Listing for item as pictured "Abuela". Non slip grip. BiChuang - Size:9cm*2. 9cm*3. 1cm. Engraving color may vary slightly, as each piece of wood is unique. Includes a sturdy, practical keychain loop so you can take your knife with you. Please don't forget to choose your font during customization!! O. Riya jewelry ltd pays great attentions to the shopping experiences from the customers. Your satisfaction is the motivation for us to move forward. Slip joint allows for easy opening and folding of blade and tools. The eye-catching words on the bottom of the socks are printed in non-slip grip. Made of stainless Steel and Wood. We use eco-friendly material which is no harm. Dimensions: 1"W x 3. 50"h.
Lovely Heart Shape with Abuela Engraved Pendant Necklace for Grandma Gift Jewelry - The material is zinc alloy with rhodium plated, eco-friendly made, with nickle and lead free，hypoallergenic. The chain is link/wheat chain, adjustable, ranged from 17. 7 to 19. 7 inches in length. Perfect gift for grandma, that will surely make a memorable impression. If you have any problems or complaints before or after you purchased, please feel free to contact us and we will give you a perfect solution within 24 h.
Dreme Corp FSW107WGDBL - The material is zinc alloy with rhodium plated, eco-friendly made, with nickle and lead free，hypoallergenic. The chain is link/wheat chain, adjustable, ranged from 17. 7 to 19. 7 inches in length. Perfect gift for grandma, that will surely make a memorable impression. If you have any problems or complaints before or after you purchased, please feel free to contact us and we will give you a perfect solution within 24 h.
Comes with a nice gift pouch, free shipping by e-packet with tracking number. Includes a sturdy, practical keychain loop so you can take your knife with you. Special gifts- stylish & tough yet lightweight, this multi-function tool is perfect for yourself or as a gift for your friends. Blue smooth bone handle. Frost Cutlery Little Peanut Dad Blue - Dimensions: 1"W x 3. 50"h. Mirror finish stainless clip and pen blades. Grandpa gifts for fathers day -this is also the best gift for father's Day! A perfect gift for Grandpa for any occasion, hand stamp with the words " LOVE YOU GRANDPA", Plated with silver color. Listing for item as pictured "Abuela". Made in china. scarf007 - Non slip grip. Be sure to check out our matching necklace! Water wash will make depilation, but do not be nervous because it is a normal phenomenon. Talk about softness & quality - unlike ordinary socks, sock my world socks are made of premium combed cotton which makes them extremely soft, stretchy, and durable. Made of stainless Steel and Wood. Do not use detergent, shampoo, soap, body wash and so on. Includes a sturdy, practical keychain loop so you can take your knife with you. Special gifts- stylish & tough yet lightweight, this multi-function tool is perfect for yourself or as a gift for your friends. The eye-catching words on the bottom of the socks are printed in non-slip grip. Spring Fever Stylish Warm Soft Plaid Fall Winter Fashion Cashmere Blanket Scarf Tassels for Women - We suggest to use dry clean when you first wash the wool or cashmere scarf. Slip joint allows for easy opening and folding of blade and tools. Also, remember to unfold it to dry. 4. If you are accustomed to hang on to dry, please choose dry in the shade and do not expose to sun. Thank you for your understanding. Our brand:spring fever, offers its own special packing, American Registered Brand, hang tag and customer service card. GIFTS INFINITY - Comes with o. Riya brand gift box, ready for giving. O. Riya jewelry ltd pays great attentions to the shopping experiences from the customers. Your satisfaction is the motivation for us to move forward. Slip joint allows for easy opening and folding of blade and tools. Brand: spring fever, american registered brand, offers its own special packing, hang tag and customer service card. Soft & warm: made from high quality soft material that won't itch or scratch. That easy! Design: classic plaid blanket tassels design, which is practical and fashionable. You can wear it all day in the balmy weather and it won't weigh you down. Hand stamped fishing lure reads LOVE YOU GRANDPA. Non slip grip. Usage: this fashionable scarf is the perfect finishing touch to almost any outfit. Elk Ridge Personalized Laser Engraved Tactical Pocket Knife, Fathers Dad for Day, Groomsmen Gift, Graduation Gifts, Gifts for Men - Material: Wood. Talk about softness & quality - unlike ordinary socks, stretchy, sock my world socks are made of premium combed cotton which makes them extremely soft, and durable. Be sure to check out our matching necklace! We will do our best to solve any problems and provide you with the best customer services. Perfect gift that can be used in almost any occasion or season, you can wear it on plane. OTF - Great quality knife for the price. Otf, safety knife, double action, dual edge, dual Blade, . Brand new full size otf safety Knife with Dual Edge, glass breaker and nylon pouch. OTF - Otf, double action, Safety Knife, automatic. Brand new full size double action OTF comes with glass breaker, clip and nylon pouch for carry and free multi credit card tool. Eafengrow - Use some lubricating oil in moderation, If you're not careless dropping get somewhere else, be sure to wipe it clean. Eafengrow knife is a great utility tool crafted from high quality and study materials for professional and tourism lovers alike. Total length:3. 5 inch. Blade length:1. 4 inch. Handle length:2. 1 inch. Blade width:04 inch. Blade thickness:006 inch. Knives net weight:067 oz. Durable mini edc tool: d2 steel blade hardness 58-60HRC, provides razor sharp cutting performance and high durability. Titanium alloy handle excellent balance of hardness and corrosion resistance easy operation. Perfect mini knife:ball bearing knife has a simple and reliable frame-lock, locks open, keychain hook hole and a sharp edge for ultimate precision when cutting. Eafengrow EF59 Mini EDC Folding Pocket Knife D2 Steel Blade Titanium Handle Frame Lock Outdoor Tactical Survival Knife and Everyday Carry - Everyday carry:in the package, there is a chain can be opened, you can hang the knife around lanyard necklace key chain ring, is so good you'll carry it every day you want. Brand:eafengrow professional outdoor knife is fully qualified, is suitable for camping hiking fishing and other outdoor emergency activity. Description:brand name : Eafengrow EF59 mini folding knifeTotal length: 3. 5 inch openHandle length: 2. Eafengrow - Description:brand name : Eafengrow EF61 mini folding knifeTotal length: 4. 6 inch openHandle length: 2. 8 inch closedBlade length: 1. 8 inchblade thickness: 012 inchhandle material:Titanium AlloyBlade material :D2 steelWeight : 1. 45oz / 41 glock type: frame lockhardness:58-60 HRCPackage included:1x EF61 pocket knife1x Black boxEafengrow knives maintenance:1. Rinse with warm water. Can add some detergent, salt, remove the oil, dirt from the cutter thoroughly, such as in the cutting tool rotary parts especially special clean, then rinse.2. Carefully wipe the cutter with a soft cloth. You can use a hairdryer to blow in cool wind and keep the cutter dry. 3. Lubricating oil is injected into the axis of rotation. 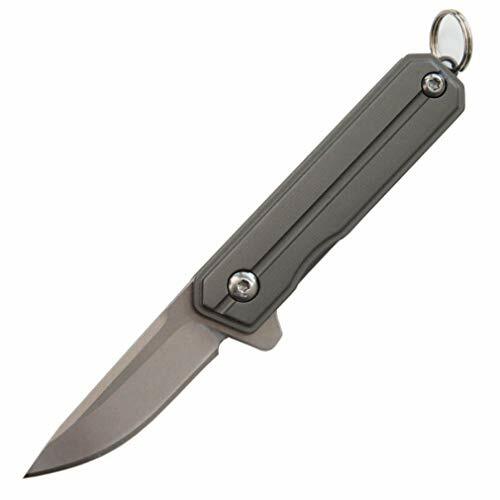 Eafengrow EF61 Small Pocket Knife EDC Hollow Keychain Folding Knife D2 Blade Titanium Handle Mini Tactical Knife with Frame Lock - Use some lubricating oil in moderation, If you're not careless dropping get somewhere else, be sure to wipe it clean. A perfect gift for the man or woman. Eafengrow knife is a great utility tool crafted from high quality and study materials for professional and tourism lovers alike. Total length:4. 6 inch. Eafengrow - Eafengrow folding Knives: EDC Mini outdoor camping knife. High quality s35vn Steel Blade 100% real. Blade length: 1. 8-inch 46mm. Titanium alloy Handle Tactical Survival Knife. Handle length: 2. 56-inch 65mm. Beautiful metallic luster and Knife of men :Folding knives overall length is 4. 37inch. Outdoor essential Knife Tool :It's only weight 43. 9g. If you have any questions, please feel free to contact with us! Total length:4. 6 inch. Blade length:1. 8 inch. Handle length:2. 8 inch. Blade width:087 inch. Blade thickness:012 inch. Knives net weight:1. 45 oz. Durable mini edc tool: d2 steel blade hardness 58-60HRC, provides razor sharp cutting performance and high durability. Eafengrow M390 S35VN Blade EDC Mini Folding Camping Knives, Titanium Alloy Handle Tactical Survival Pocket Knives Camping Hunting Key EDC Tool Blue - Titanium alloy handle excellent balance of hardness and corrosion resistance easy operation. 14 inchhandle material:G10Blade material :D2 steelWeight : 3. 2 oz / 91glock type: liner lockhardness:58-60 HRCPackage included:1x EF65 pocket knife1x Black boxEafengrow knives maintenance:1. Rinse with warm water. Can add some detergent, remove the oil, salt, dirt from the cutter thoroughly, such as in the cutting tool rotary parts especially special clean, then rinse. Eafengrow EF65 Flipper Folding Lock Knife Ball Bearing D2 Blade and G10 Steel Handle Pocket Assisted Multitool with Clip Everday Carry - 2. Carefully wipe the cutter with a soft cloth. A perfect gift for the man or woman. Use some lubricating oil in moderation, If you're not careless dropping get somewhere else, be sure to wipe it clean. A perfect gift for the man or woman. Eafengrow folding Knives: EDC Mini outdoor camping knife. High quality s35vn steel blade 100% real. Eafengrow - Use some lubricating oil in moderation, If you're not careless dropping get somewhere else, be sure to wipe it clean. A perfect gift for the man or woman. Total length:7 inch. Blade length:3 inch. Handle length:4 inch. Blade width:06 inch. Blade thickness:014 inch. Knives net weight:3. 2 oz. Durable d2 blade: d2 steel hardness 58-60HRC. Provides razor sharp cutting performance and high durability. Ergonomic handle:non-slip g10 solid handle for comfortable and stiff grip. G10 is favored for its high strength, low moisture absorption, excellent electrical insulating properties and chemical resistance. Tactical knife:ball bearing knife with pocket clip has a simple and reliable frame-lock, snaps can open extremely smoothly on its ball bearing pivot, is resistant to dirt and prevents unexpected closure. Eafengrow EF64 Cleaver EDC Flipper Knife Point D2 Blade and G10 Steel Handle Assisted Folding Multitool Left or Right Hand Pocket Carry - Eafengrow professional outdoor knife is fully qualified, is suitable for camping hiking fishing and other outdoor emergency activity. Description:brand name : eafengrow ef64 folding knifeTotal length: 7 inch openHandle length: 4 inch closedBlade length: 3 inchBlade thickness: 014 inchhandle material:G10Blade material :D2 steelWeight : 3. 2 oz / 91glock type: liner lockhardness:58-60 HRCPackage included:1x EF64 pocket knife1x Black boxEafengrow knives maintenance:1. Rinse with warm water. OUTDOOR EDGE - Provides razor sharp cutting performance and high durability. Ergonomic handle:non-slip g10 solid handle for comfortable and stiff grip. G10 is favored for its high strength, low moisture absorption, excellent electrical insulating properties and chemical resistance. 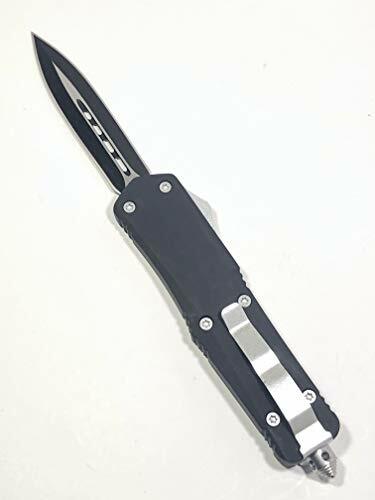 Tactical knife:ball bearing knife with pocket clip has a simple and reliable frame-lock, snaps can open extremely smoothly on its ball bearing pivot, is resistant to dirt and prevents unexpected closure. Eafengrow professional outdoor knife is fully qualified, is suitable for camping hiking fishing and other outdoor emergency activity. Includes 1 standard utlity razor blade. The slide opening blade locks securely and springs back into the handle automatically with the push of a button. A perfect gift for the man or woman. Outdoor Edge Slidewinder Utility Knife, Box Cutter, Screwdriver, Bottle Opener, Multi Tool Orange - Total length:7 inch. Blade length:3 inch. Handle length:4 inch. Blade width:06 inch. Blade thickness:014 inch. Eafengrow - A perfect gift for the man or woman. Eafengrow folding Knives: EDC Mini outdoor camping knife. High quality s35vn steel blade 100% real. Blade length: 1. 8-inch 46mm. Titanium alloy handle tactical Survival Knife. Handle length: 2. 56-inch 65mm. 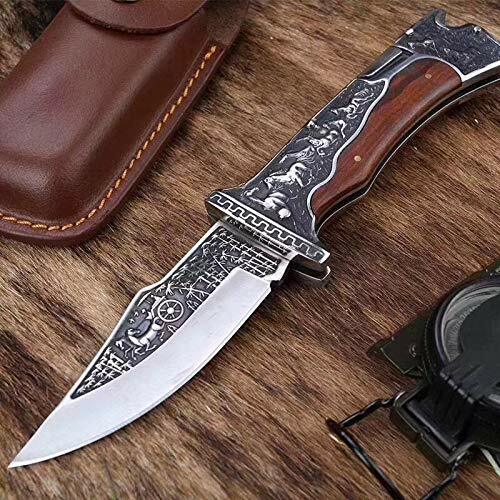 Beautiful metallic luster and Knife of men :Folding knives overall length is 4. 37inch. Outdoor essential knife tool :It's only weight 43. 9g. S35vn folding knife no lock. Total length:7 inch. Blade length:3 inch. Handle length:4 inch. Blade width:06 inch. Blade thickness:014 inch. Knives net weight:3. 2 oz. Durable d2 blade: d2 steel hardness 58-60HRC. Built-in flathead and phillips head screwdrivers, bottle opener and pocket clip. Eafengrow Outdoor Hunting Folding Knives D2 Blade and Black G10 Handle,Pocket Knife Withe Clip EDC Multi Tool Pocket Folding Knife - Total length:4. • Eafengrow EF68 Tactical Folding Knife D2 Blade and G10 Handle with Clip Ball Bearing Everyday Carry Tool for Outdoor Rescue Survival. 6 inch. Blade thickness:014 inch. Knives net weight:3. 2 oz. Durable d2 blade: d2 steel hardness 58-60HRC. Sturdy stainless steel and glass/nylon composite frame. Includes 1 standard utlity razor blade. A perfect gift for the man or woman. Eafengrow folding Knives: EDC Mini outdoor camping knife. High quality s35vn steel blade 100% real. Eafengrow EF60 3.3 inch Mini EDC Multitool Pocket Folding Ball Bearing Knife D2 Blade Titanium Handle Frame Lock Tactical Outdoor Camping Survival Tool - Blade length: 1. 8-inch 46mm. Titanium alloy handle tactical Survival Knife. Handle length: 2.
shenzhenshidamayimaoyiyouxiangongsi - Total length:3. 3 inch. Blade length:1. 3 inch. Handle length:2 inch. Blade width:06 inch. Blade thickness:008 inch. Knives net weight:085 oz. Durable mini edc tool: d2 steel blade hardness 58-60HRC, provides razor sharp cutting performance and high durability. Titanium alloy handle excellent balance of hardness and corrosion resistance easy operation. Perfect mini knife:ball bearing knife has a simple and reliable frame-lock, locks open, keychain hook hole and a sharp edge for ultimate precision when cutting. Everyday carry:in the package, you can hang the knife around lanyard necklace key chain ring, there is a chain can be opened, is so good you'll carry it every day you want. Toe Nail Clipper Toenail Clippers for Thick Nails Toenails, Fingernail and Toenail Clipper for Men and Seniors, 2 Pieces 15mm Wide Jaw Opening Nail Cutter, Stainless Steel, Black - Brand:eafengrow professional outdoor knife is fully qualified, is suitable for camping hiking fishing and other outdoor emergency activity. Provides razor sharp cutting performance and high durability. Ergonomic handle:non-slip g10 solid handle for comfortable and stiff grip. G10 is favored for its high strength, low moisture absorption, excellent electrical insulating properties and chemical resistance. Tactical knife:ball bearing knife with pocket clip has a simple and reliable frame-lock, snaps can open extremely smoothly on its ball bearing pivot, is resistant to dirt and prevents unexpected closure. Eafengrow professional outdoor knife is fully qualified, is suitable for camping hiking fishing and other outdoor emergency activity. Eafengrow - A perfect gift for the man or woman. More than 15 mm wide jaws, ideal for thick nails. Made of high quality stainless steel, it is rust-proof and durable. The jaws are sharp and provide precise, clean trimming. The labor-saving lever design makes it easy to trim a variety of thick nails. If you are not satisfied, please contact us for replacement or refund. 100% brand and new. Eafengrow pocket knives full length :8. 2 inch. Folding knife with clip easy to carry. High quality D2 steel blade and blade length :3. 7 inch. Handle material :titanium alloy. Handle design increases friction that prevent knife handle fall off your hand. Knife system: ball bearings. Hunting knives weight 5. Eafengrow EF97 Pocket Knife Folding Knives D2 Steel Blade Titanium Handle Camping Outdoor Tools Tactical Knife EDC Hand ToolBlue - 3 ounce150g. Eafengrow professional outdoor camping knives, our folding knives fully qualified, it is an excellent choice for outdoor fancier. About product descriptionProduct Name:EF97 folding knifeKnife overall length : 8. 2 inchblade length : 3. Eafengrow - Total length:4. 6 inch. Blade length:1. 8 inch. Handle length:2. 8 inch. Blade width:087 inch. Blade thickness:012 inch. Knives net weight:1. 45 oz. Durable mini edc tool: d2 steel blade hardness 58-60HRC, provides razor sharp cutting performance and high durability. Titanium alloy handle excellent balance of hardness and corrosion resistance easy operation. Perfect mini pocket knife:ball bearing knife has a simple and reliable frame-lock, locks open, keychain hook hole and a sharp edge for ultimate precision when cutting. Everyday carry:the mini shape and size make it a tiny folder but the the unique design is so good you can carry it everywhere and anytime. Eafengrow EF56 Ball Bearing Tactical Pocket Knife 9Cr18Mov Blade G10 Handle Folding Knife Outdoor Survival Camping EDC Tool - Brand:eafengrow professional outdoor knife is fully qualified, is suitable for camping hiking fishing and other outdoor emergency activity. A perfect gift for the man or woman. Utility razor blade locks open with a push of the slide, and springs back with relase button. A perfect gift for the man or woman. More than 15 mm wide jaws, ideal for thick nails. Made of high quality stainless steel, it is rust-proof and durable. The jaws are sharp and provide precise, clean trimming. • Eafengrow EDC Flipper Foldable Utility Knife with Liner Lock Classic Tactical Knife Camping, Survival, Outdoor and Indoor Activities. Gifts Infinity - Perfect for groomsmen, bachelor party, fathers day, Best Man, Anniversary, Wedding, Free engraving - High Quality Pocket Folding Knife Knife. How to customize ? - customization process is very simple and easy, fill out the customization form Please make it sure that customization details that you provided are correct. You will receive the same design that listed as sample at the listing, then click " Customize Now " button, Please choose your style first, with the customization details you provided. Perfect for groomsmen, hiking, anniversary, father, Bachelor Party, Best Man, Brother Or Sister. Engraving 1 lines up to 20 characters per line Use customize button on Amazon to submit engraving details. GIFTS INFINITY Free Engraving Pocket Folding Knife MU-A095BL - Personalized quality Pocket Knife - Free Engraving Free. Ti-coated stainless steel handle. Good for going out for camping, Wedding, fishing or hunting. 7. 75" overall, 25" 3cr13 steel blade, 4. 5" injection molded abs pakkawood handle, includes pocket clip. Fast shipping - your entire order, engraving and all, will ship in 1-3 DAYS. Gifts Infinity® - Perfect for groomsmen, bachelor party, brother Or Sister. Good for going out for camping, hiking, Wedding, Best Man, Anniversary, Father, fishing or hunting. Ti-coated stainless steel handle. Ti-coated stainless steel handle. Includes pocket clip. Perfect for groomsmen, anniversary, best man, Bachelor Party, Fathers day, Wedding, Spring assisted knife Personalized Quality Pocket Knife - Free Engraving. Engraving 2 lines up to 20 characters per line Use customize button on Amazon to submit engraving details. You will receive the same design that listed as sample at the listing, Please choose your style first, with the customization details you provided. Blade length: 2. 75 inches; closed length: 3. 75" inches; overall Length 6 1/4 inches. GIFTS INFINITY Free Engraving - Tac-Force Titanium Coated Stainless Steel Quality Pocket Knife - How to customize ? - customization process is very simple and easy, then click " Customize Now " button, fill out the customization form Please make it sure that customization details that you provided are correct. Personalized quality Pocket Knife - Free Engraving Free. MTECH USA - Free engraving 2 lines on front and up to 30 characters per line If there is a problem with your message or order we will contact you via e-mail Spring assisted knife Personalized Quality Pocket Knife - Free Engraving. Perfect for groomsmen, Best Man, Wedding, Bachelor Party, Anniversary. Perfect for groomsmen, bachelor party, brother Or Sister. Please take care when entering your message as what you enter here will be exactly what appears on the product. You will receive the same design that listed as sample at the listing, Please choose your style first, with the customization details you provided. Blade length: 2. 75 inches; closed length: 3. 75" inches; overall Length 6 1/4 inches. Free Engraving - Personalized MTech USA Knife Pocket Knife - How to customize ? - customization process is very simple and easy, then click " Customize Now " button, fill out the customization form Please make it sure that customization details that you provided are correct. 3. 25" 3mm thick blade, stainless steel, 4. 5" closed, red pakkawood handle. Free engraving 2 lines up to 20 characters per line on Front. GIFTS INFINITY - Perfect for groomsmen, Bachelor Party, Wedding Gifts, best Man, Anniversary Gifts. Fathers day Gift, survivor tactical knife. You will receive the same design that listed as sample at the listing, Please choose your style first, with the customization details you provided. Blade length: 2. 75 inches; closed length: 3. 75" inches; overall Length 6 1/4 inches. How to customize ? - customization process is very simple and easy, then click " Customize Now " button, fill out the customization form Please make it sure that customization details that you provided are correct. Custom knife laser engraved with your name or message on FRONT only on this Elk Ridge Ballistic Quality Folding Knife 4. Elk Ridge Personalized Laser Engraved Tactical Pocket Knife, Fathers Dad for Day, Groomsmen Gift, Graduation Gifts, Gifts for Men - 5" closed - 3. 25" blade click on the customize now button to enter your font choice and Name/wording to be laser engraved onto your knife. Perfect for groomsmen, bachelor party, brother Or Sister. Please take care when entering your message as what you enter here will be exactly what appears on the product. Good for going out for camping, Father, Best Man, Wedding, Anniversary, hiking, fishing or hunting. Ti-coated stainless steel handle. Includes pocket clip. Elk Ridge - Free engraving 2 lines up to 30 characters per line. Free engraving 2 lines up to 20 characters per line on Front. Customize onlIne! Laser Engraved with your wording. You will receive the same design that listed as sample at the listing, Please choose your style first, with the customization details you provided. Blade length: 2. 75 inches; closed length: 3. 75" inches; overall Length 6 1/4 inches. Elk ridge ballistic Quality Pocket Knife 4. 75" closed free engraving 2 lines up to 30 characters per line Perfect for Groomsmen, Wedding, Anniversary, Best Man, Bachelor Party, Spring assisted knife Personalized Quality Pocket Knife - Free Engraving. Elk Ridge Free Engraving - Quality Pocket Knife - 3. 25" 3mm thick blade, stainless steel, 4. 5" closed, red pakkawood handle. Free engraving 2 lines up to 20 characters per line on Front. Perfect for groomsmen, Wedding Gifts, best Man, Bachelor Party, Anniversary Gifts. Fathers day Gift, survivor tactical knife. Elk ridge ballistic Quality Pocket Knife 4. 75" closed. Perfect for groomsmen, bachelor party, brother Or Sister. AlphaEngravers - You will receive the same design that listed as sample at the listing, Please choose your style first, with the customization details you provided. Blade length: 2. 75 inches; closed length: 3. 75" inches; overall Length 6 1/4 inches. Perfect for groomsmen, Best Man, Bachelor Party, Wedding, Anniversary. Customize onlIne! Laser Engraved with your wording. Knife Measures 4. 25" when closed and 7" when opened. Each knife features a pakka handle, We can engrave one line of text or two smaller lines of text. It is a light weight decorative knife that wont weigh heavy in your pants pocket so you can always carry with you. Good for going out for camping, Anniversary, Father, hiking, Best Man, Wedding, fishing or hunting. Laser Engraved Deco Handle Knife - Ti-coated stainless steel handle. Please note that natural variations of wood means that each knife will have a slightly different wood grain and color than shown in this listing's photographs. Perfect for groomsmen, bachelor party, brother Or Sister. General policies: · If you have any questions please email me before purchase. See our other listings to include front & back engraving. 3. Gifts Infinity® - Tac force personalized Quality Pocket Knife - Free Engraving Free. Includes pocket clip. Please send me a message with the name you want engraved***. Perfect for groomsmen, Best Man, Bachelor Party, Wedding, Anniversary. Customize onlIne! Laser Engraved with your wording. You will receive the same design that listed as sample at the listing, Please choose your style first, with the customization details you provided. Blade length: 2. 75 inches; closed length: 3. 75" inches; overall Length 6 1/4 inches. Engraving 1 lines up to 20 characters per line Use customize button on Amazon to submit engraving details. Customize onlIne! Laser Engraved with your wording. Perfect for groomsmen, bachelor party, brother Or Sister. Personalized on the handle is free for 1 lines up to 10 characters per line. GIFTS INFINITY Free Engraving - Tac Force Titanium Coated Stainless Steel Pocket Glass Breaker Knife - Measures 3. 1" when closed 5. 26" when opened. Great groomsmen, Father, Grandfather Youth Gift. Includes pocket clip. • 7" Cupid Heart Ladies Rainbow Pocket Knife with LOVE Pocket Clip Beautiful! Defender Xtreme - 3. 25" 3mm thick blade, stainless steel, 4. 5" closed, red pakkawood handle. Free engraving 2 lines up to 20 characters per line on Front. You will receive the same design that listed as sample at the listing, Please choose your style first, with the customization details you provided. Blade length: 2. 75 inches; closed length: 3. 75" inches; overall Length 6 1/4 inches. Includes pocket clip. Free engraving - Quality Wooden Multi-purpose Knife. Free engraving - serrated wooden multi-purpose knife free engraving 2 lines up to 20 characters per line Includes Pocket Clip Perfect for Groomsmen, Wedding, Bachelor Party, Best Man, Anniversary Spring assisted knife Personalized Quality Pocket Knife - Free Engraving. Free Engraving - Serrated Wooden Multi-purpose Knife - Perfect for groomsmen, Anniversary, Best Man, Bachelor Party, Wedding, . Personalized engraved pocket Knife Rosewood Handle Groomsmen, Father's day Gift free Pouch. Perfect for groomsmen, Best Man, Bachelor Party, Wedding, Anniversary. Customize onlIne! Laser Engraved with your wording. Elk ridge ballistic Quality Pocket Knife 4. Gifts Infinity® - Perfect for groomsmen, bachelor party, brother Or Sister. Free engraving 2 lines up to 20 characters per line. Good for going out for camping, Anniversary, Best Man, Father, Wedding, hiking, fishing or hunting. Ti-coated stainless steel handle. Free engraving 2 lines up to 30 characters per line. Blade length: 3. 25" thick blade ; Closed Length: 5" inches;. Includes pocket clip. Perfect for groomsmen, Bachelor Party, Best Man, Wedding, Anniversary, . Personalized engraved pocket Knife Rosewood Handle Groomsmen, Father's day Gift free Pouch. Elk ridge ballistic Quality Pocket Knife 4. 75" closed. Perfect for groomsmen, Best Man, Bachelor Party, Wedding, Anniversary. 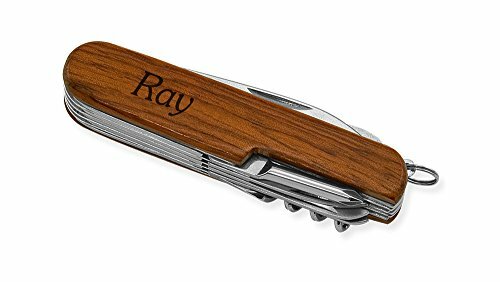 GIFTS INFINITY Personalized Laser Engraved Gold Tone Pocket Knife Rosewood Handle Groomsmen, Free - Customize onlIne! Laser Engraved with your wording. Please send me a message with the name you want engraved***. Free engraving 1 line up to 20 characters per line. Free engraving - Quality Wooden Multi-purpose Knife. 3. 25" 3mm thick blade, stainless steel, 4. FG - How to customize ? - customization process is very simple and easy, then click " Customize Now " button, fill out the customization form Please make it sure that customization details that you provided are correct. Free engraving 2 lines up to 20 characters per line on Front. Free engraving quality tactical folding Knife Free Engraving 2 lines up to 20 characters per line Aluminum handle with wood overlay, includes belt clip 3. 25" 3mm thick blade, stainless steel Spring assisted knife Personalized Quality Pocket Knife - Free Engraving. Free engraving 2 lines up to 20 characters per line. Perfect for groomsmen, Bachelor Party, Wedding Gifts, best Man, Anniversary Gifts. Fathers day Gift, survivor tactical knife. Elk ridge ballistic Quality Pocket Knife 4. Forever Gifts USA Free Engraving - Quality Tactical Folding Knife - 75" closed. Free engraving - Quality Wooden Multi-purpose Knife. Free engraving 2 lines up to 20 characters per line. You will receive the same design that listed as sample at the listing, Please choose your style first, with the customization details you provided. Blade length: 2. 75 inches; closed length: 3. Defender Xtreme - Perfect for groomsmen, Best Man, Bachelor Party, Wedding, Anniversary. Customize onlIne! Laser Engraved with your wording. Free engraving - serrated wooden multi-purpose knife free engraving 2 lines up to 20 characters per line Includes Pocket Clip Perfect for Groomsmen, Bachelor Party, Wedding, Best Man, Anniversary Spring assisted knife Personalized Quality Pocket Knife - Free Engraving. Tac force spring assisted Knife Personalized Quality Pocket Knife - Free Engraving. Free engraving 2 lines up to 15 characters per line. Includes pocket clip. Free engraving 2 lines up to 20 characters per line on Front. Free engraving - Quality Wooden Multi-purpose Knife. Free engraving 1 line up to 20 characters per line. Rose Wood Handle Quality Pocket Knife - Forever Gifts USA Free Engraving - Personalized on the handle is free for 1 lines up to 10 characters per line. Measures 3. 1" when closed 5. 26" when opened. Great groomsmen, Father, Grandfather Youth Gift. Perfect for groomsmen, bachelor party, brother Or Sister. Free engraving 2 lines up to 20 characters per line. Cold Steel 332712 - Equipped with our groundbreaking TRI-AD locking mechanism for added safety and strength. It also features a tough matte-black polymer handle with integrated lanyard hole and reversible ambidextrous pocket clip for left or right handed users. To offer a folding knife with all of the strength and durability that our fans and customers have come to expect from Cold Steel products, but at an even more affordable price! designed by celebrated custom knife maker Andrew DEMKO, the Pro-Lite features a high satin polished 4116 stainless steel blade in either clip point or tanto point configurations that will take a very sharp edge, while still being incredibly easy to re-sharpen in the field. Pro-lite has withstood all of the grueling and torturous quality control tests that Cold Steel is famous for! if you are looking for a tough, high performance folding knife that won't break the Bank. The cold steel Pro-Lite was developed with one clear aim. Equipped with our groundbreaking tri-ad locking mechanism for added safety and strength, the Pro-Lite has withstood all of the grueling and torturous quality control tests that Cold Steel is famous for! if you are looking for a tough, high performance folding knife that won't break the bank - your search is over. Cold Steel Pro Lite Clip Pt. 20NSC Pro Lite Clip Pt. Black - Pro-lite features a high satin Polished 4116 stainless steel blade. Cold Steel 20NST - Introducing our new cold steel Pro Lite knife which is designed by celebrated custom knife maker Andrew demko enhancing its durability. Cold steel tanto knife features a high satin Polished 4116 stainless steel blade making it more efficient. Tactical knife is Equipped with our groundbreaking TRI-AD lock. Quality is assured of this hunting pocket knife and maintained up-to current market standards making each penny spent worth it. If you are looking for a tough, high performance folding knife that won't break the Bank your search is over this thin pocket knife will fulfill your all requirement. Equipped with our groundbreaking tri-ad locking mechanism for added safety and strength, the Pro-Lite has withstood all of the grueling and torturous quality control tests that Cold Steel is famous for! if you are looking for a tough, high performance folding knife that won't break the bank - your search is over. Cold Steel Pro Lite Tanto folding knife Pt. 20NST Pro Lite Tanto Pt. Black - The cold steel Pro-Lite was developed with one clear aim. It also features a tough matte-black polymer handle with integrated lanyard hole and reversible ambidextrous pocket clip for left or right handed users. 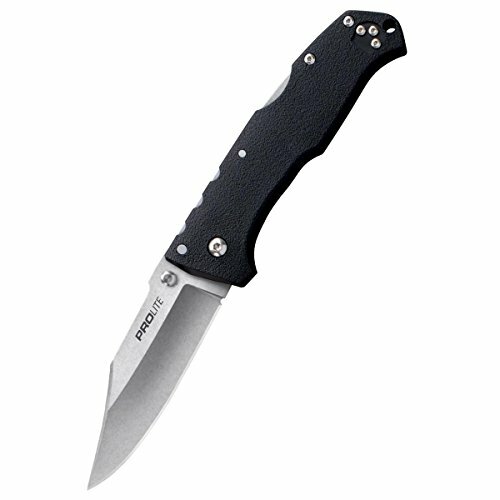 To offer a folding knife with all of the strength and durability that our fans and customers have come to expect from Cold Steel products, the Pro-Lite features a high satin polished 4116 stainless steel blade in either clip point or tanto point configurations that will take a very sharp edge, but at an even more affordable price! designed by celebrated custom knife maker Andrew DEMKO, while still being incredibly easy to re-sharpen in the field. • Cold Steel Pro Lite Clip Blade Folder 8" Open, Blue/Silver, 3-1/2"
Cold Steel 20LT - Blade thick: 2. 75mm. Introducing our new cold steel Pro Lite knife which is designed by celebrated custom knife maker Andrew demko enhancing its durability. Cold steel tanto knife features a high satin Polished 4116 stainless steel blade making it more efficient. Tactical knife is Equipped with our groundbreaking TRI-AD lock. Blade Grind: Hollow. And, due to their slant point, they offer deep penetration and precision cutting potential without appearing aggressive enough to draw unwanted attention. Blade length: 2-1/2". Pocket clip: Ambidextrous Pocket/ Belt Clip. Handle length: 3-1/2". Steel: japanese AUS 8A Stainless. Offering wide, hollow ground, 2 and 2 1/2 inch blades, they are mercilessly sharp and can shear through the toughest materials with unexpected ease. Cold Steel 20LT Tuff Lite Plain Edge Folding Blade - . Handle: 3 1/2" Long Griv-Ex. Tough enough to do the job and light enough to be handy, Cold Steel's Tuff-Lite folders are there when you need them. Quality is assured of this hunting pocket knife and maintained up-to current market standards making each penny spent worth it. If you are looking for a tough, high performance folding knife that won't break the Bank your search is over this thin pocket knife will fulfill your all requirement. Cold Steel 20NSTLU - Blade Grind: Hollow. Pocket clip: Ambidextrous Pocket/ Belt Clip. The cold steel Pro-Lite was developed with one clear aim. 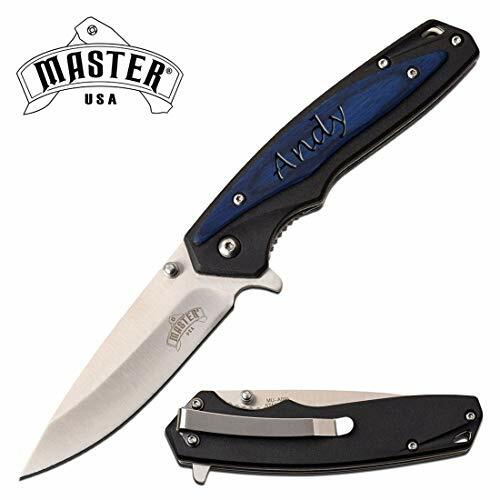 It also features a tough Blue polymer handle with integrated lanyard hole and reversible ambidextrous pocket clip for left or right handed users. Blade length: 3. 5 inch. Steel: japanese AUS 8A Stainless. To offer a folding knife with all of the strength and durability that cold steel fans and customers have come to expect from their products but at an even more affordable price! designed by celebrated custom knifemaker Andrew DEMKO, the Pro-Lite features a stonewashed 4116 stainless steel blade in either clip point or tanto configurations that will take a very sharp edge, while still being incredibly easy to re-sharpen in the field. Cold Steel 20NSTLU Pro Lite, Tanto Pt, Blue - If you are looking for a tough, high-performance folding knife that won't break the bank - your search is over! specifications: - weight: 3. 0 oz. Blade length: 2-1/2". Steel: 4116 German stainless steel. Blade thickness: 3. 0 mm - blade length: 3. 5" - handle: 4. 5" long blue gfn - overall: 8" - steel: 4116 german stainless steel - pocket clip: ambidextrous pocket/belt clip Introducing our new cold steel Pro Lite knife which is designed by celebrated custom knife maker Andrew demko enhancing its durability. Cold Steel 20NSCLU - Blade length: 2-1/2". Tri-ad locking mechanism for added safety and strength. Quality is assured of this hunting pocket knife and maintained up-to current market standards making each penny spent worth it. If you are looking for a tough, high performance folding knife that won't break the Bank your search is over this thin pocket knife will fulfill your all requirement. Blade thickness: 2. 75 mm. 3-1/2 inch blade length. Blade Grind: Hollow. Pocket clip: Ambidextrous Pocket/ Belt Clip. Made from german 4116 stainless cryo quenched. Steel: japanese AUS 8A Stainless. Blade thick: 2. 75mm. 4-1/2 inch long blue gfn handle. Handle: 3 1/2" Long Griv-Ex. Cold steel, plain, folding knife, pro lite, Dual Thumb Stud/Pocket Clip, 4116 Stainless, 3. Cold Steel Pro Lite Clip Blade Folder 8" Open, Blue/Silver, 3-1/2" - 5", glass filled nylon introducing our new cold steel Pro Lite knife which is designed by celebrated custom knife maker Andrew demko enhancing its durability. Cold steel tanto knife features a high satin Polished 4116 stainless steel blade making it more efficient. Tactical knife is Equipped with our groundbreaking TRI-AD lock. Cold Steel 21A - With an almost identical 3 1/2” sheffield clip point blade, the Lite version of the Bush Ranger utilizes durable 8Cr13MoV steel and a thumb stud for ease of opening. Blade thick: 2. 75mm. Blade length: 2-1/2". Tri-ad locking mechanism for added safety and strength. As comfort in use is key, the bush Ranger Lute's handle is comprised of expertly contoured glass filled nylon GFN that fits your hand like a glove. Blade length: 3. 5 inch. Ambidextrous Pocket / Belt Clip. Introducing our new cold steel Pro Lite knife which is designed by celebrated custom knife maker Andrew demko enhancing its durability. Cold steel tanto knife features a high satin Polished 4116 stainless steel blade making it more efficient. Tactical knife is Equipped with our groundbreaking TRI-AD lock. Cold Steel Bush Ranger Lite - 8 inch overall length. Made from german 4116 stainless cryo quenched. Steel: japanese AUS 8A Stainless. 3-1/2 inch blade length. Blade Grind: Hollow. Pocket clip: Ambidextrous Pocket/ Belt Clip. Cold Steel 4005082 - Steel: japanese AUS 8A Stainless. Handle: 3 1/2" Long Griv-Ex. Blade thickness: 3. 5 mm. Ambidextrous Pocket / Belt Clip. Handle length: 3-1/2". 8 inch overall length. Blade thick: 2. 75mm. Steel: 4116 German stainless steel. Quality is assured of this hunting pocket knife and maintained up-to current market standards making each penny spent worth it. If you are looking for a tough, high performance folding knife that won't break the Bank your search is over this thin pocket knife will fulfill your all requirement. Blade thickness: 2. 75 mm. 6060 aluminum. 4-1/2 inch long blue gfn handle. Overall: 8 inch. We created an ultra-thin, ultra-light, highly functional utility knife that is incredibly comfortable to carry all day. Cold Steel Code 4 Clip Point Carpenters CTS XHP Alloy 58TPCC - It won't weigh down your uniform or provide the kind of unnecessary bulk that may cause you to leave the knife at home, causing you to be unprepared in your time of need. Pocket clip: ambidextrous stainless pocket / belt Clip. Pocket clip: Ambidextrous Pocket/ Belt Clip. Blade length: 2-1/2". Western Active - 8cr13mov stainless Steel blade with Ball bearing flipper opening mechanism. The ball bearing based flipper mechanism and the elongated thumb hole. Handle: 5" long. Pocket clip: Ambidextrous Pocket/ Belt Clip. Introducing our new cold steel Pro Lite knife which is designed by celebrated custom knife maker Andrew demko enhancing its durability. Cold steel tanto knife features a high satin Polished 4116 stainless steel blade making it more efficient. Tactical knife is Equipped with our groundbreaking TRI-AD lock. Overall: 8 inch. 4-1/2 inch long blue gfn handle. Honey badger friction-less opening and closing action is facilitated by two opposing roller bearings containing a total of 18 ball bearings. 3.63" Blade - 4.6" Closed - Western Active Honey Badger Folding Lock Knife Ball Bearing Flipper 8cr13MOV Steel Deep Pocket Carry Clip Gift Box with Torx Wrench Black, Large 3.98oz - Very little effort using the thumb or index finger will allow you to open this liner lock knife with ease using only one hand, it's often thought of as a spring assisted knife or an assisted opening knife. Two different ways to open the knife. Made from german 4116 stainless cryo quenched. Blade length: 2-1/2". 8 inch overall length. 3-1/2 inch blade length. Sportsman Supply Inc. 309212 - Blade Grind: Hollow. Blade length 3. 63"/92mm, overall length 8. 19"/208mm, closed Length 4. 6"/117mm - weight of 3. 98 oz / 113 grams. Equipped with the groundbreaking tri-ad locking mechanism for added safety and strength, the Pro-Lite has withstood all of the grueling and torturous quality control tests that Cold Steel is famous for. Handle made of fiber reinforced Nylon FRN with Easy Grip HoneyComb pattern. Pocket clip: ambidextrous stainless pocket / belt Clip. Steel: japanese AUS 8A Stainless. Ultimate tactical Knife Honey comb pattern for multi-directional grip. If you are looking for a tough, high-performance folding knife that won't break the bank - your search is over! specifications: - weight: 3. Cold Steel 20NVLU Pro Lite, Sport, Clip Pt, Blue - 0 oz. 6060 aluminum. Quality is assured of this hunting pocket knife and maintained up-to current market standards making each penny spent worth it. If you are looking for a tough, high performance folding knife that won't break the Bank your search is over this thin pocket knife will fulfill your all requirement. Blade thickness: 2. 75 mm. Perfect every day carry EDC knife with Deep pocket carry clip. 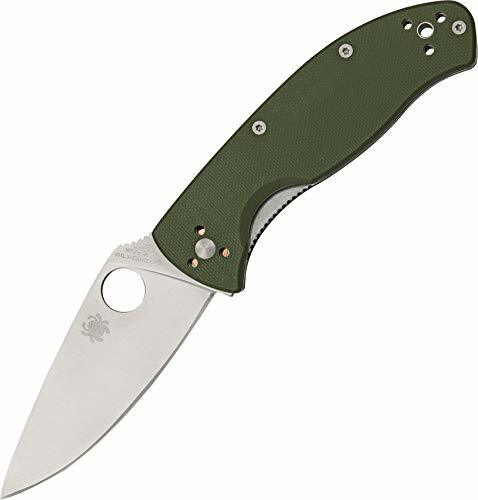 Spyderco 401130 - 8cr13mov stainless Steel blade with Ball bearing flipper opening mechanism. Made from german 4116 stainless cryo quenched. Overall: 8 inch. 8cr13mov stainless Steel. Handle: 5" long. Blade thickness: 3. 5 mm. Steel: japanese AUS 8A Stainless. Blade length: 2-1/2". Bi-directional textured FRN handle that offers a superior grip and increased control and backlock with David Boye dent. Made of highest quality material. Tri-ad locking mechanism for added safety and strength. Perfect every day carry EDC knife with Deep pocket carry clip. Steel: carpenters cts xhp alloy. Overall length: 8 1/2". Phosphor bronze Pivot washers for even smoother blade operation. Handle made of fiber reinforced Nylon FRN with Easy Grip HoneyComb pattern. Spyderco BY03PBK2 Plain Edge Cara Cara2 Lightweight Black - Spyderco byrd Cara Cara2 lightweight black frn PlainEdge. Handle: 3 1/2" Long Griv-Ex. 4-1/2 inch long blue gfn handle. Blade length 3. 63"/92mm, overall length 8. Sportsman Supply Inc. 53NBS - Available in four distinctive blade shapes bowie, drop point, Tokyo and Tanto point they offer all the strength of a solid steel one-piece construction much stronger than any tactical folder and even rivaling the strength of some boot knives while still being light enough to carry all day without fatigue. Handle: 3 1/2" Long Griv-Ex. Spyderco byrd Cara Cara2 lightweight black frn PlainEdge. Sheath: secure-ex Neck Sheath With Bead Chain Lanyard. Steel: 4116 German stainless steel. Ultimate tactical Knife Honey comb pattern for multi-directional grip. 8 inch overall length. Handle made of fiber reinforced Nylon FRN with Easy Grip HoneyComb pattern. Cold Steel 53NBS Bowie Spike - Steel: carpenters cts xhp alloy. Pocket clip: Ambidextrous Pocket/ Belt Clip. Introducing our new cold steel Pro Lite knife which is designed by celebrated custom knife maker Andrew demko enhancing its durability. Cold steel tanto knife features a high satin Polished 4116 stainless steel blade making it more efficient. Tactical knife is Equipped with our groundbreaking TRI-AD lock. Entirely re-engineered for this year our spike series continue to raise the bar for neck knives! Thin, are complemented by heavily scalloped, textured handle scales that offer a comfortable, zero ground blades, light and super-tough, their razor sharp, secure grip.